As a PUC nursing graduate, one question I often get about the program is, “Will I have time for myself?” The answer is 100 percent yes! Of course you will have days where you spend every waking minute doing homework, but not every day is like that. The easiest way to not get overwhelmed is good time management. If you don’t manage your time well, start practicing now. If you can’t manage your time the program can overwhelm you. I took it one day at a time and got as much done as possible, and that’s really all you can do. I played intramurals for the first year, but once second year came I didn’t have enough time with two clinical days; I ran 4 times a week, and I kept the Sabbath. You definitely have enough time if you use it wisely. Keeping the Sabbath was a huge blessing for me. I would feel completely overwhelmed during the week and then Sabbath would arrive. It helped keep my anxiety down, and I never missed an assignment or got a lower grade because I didn’t do homework on the Sabbath. Sleep in, spend time with God, your friends and family, and let yourself de-stress for a day. It’s important. A big part of my life is exercise. I did wonder if I could keep up with it during the program. For me; I wasn’t willing to compromise my own health for any program. I would sit down and look at my schedule and figure out when I could run. It was literally one hour four times a week and it was totally doable. Running has always been a huge de-stressor for me. It gave me an hour to think and have time to myself. It kept me from worrying as much and I was happier because of it. Another thing I wouldn’t compromise on was my sleep. I honestly never went to bed after midnight because I didn’t procrastinate. If you get everything done, then do something that isn’t due until next week! You never know when something could come up and you suddenly are out of time. If you have spare time; use it to get ahead instead of scrambling to get things in on time. In all seriousness; I managed my time very well and it truly saved me. There are plenty of hours in the day to complete everything and have time for yourself. Certain quarters are going to be harder in different ways, but take it one day and one assignment at a time and you will get through it. The greatest thing I gained from the nursing program at PUC was my relationship with God. I took for granted the fact my teacher’s prayed before every test, and reminded us God had a plan for us. When I felt so overwhelmed I wanted to quit, God reminded me His plan was the best plan. I grew in my relationship with God, and began to rely on Him when I felt I couldn’t make it. In many a sleepless night I would talk with God and pray I would pass. Every time (to this day) I lie awake with the knot twisting in my stomach on the night before a test I whisper to myself, “God has a plan.” I tell myself this over and over and over because it’s the greatest truth and gives me the most peace. I always say I think God laughs at me because of how much I worry. Being close to God changed my worrying and anxiety throughout the program. Worry will always be something I struggle with, but I have begun to learn how to keep it at bay. I’ve learned God has a plan and I don’t need to put so much pressure on myself to make all the right decisions. I chose to give Him control, and that gives me peace. Trust in the Lord always; He has written the greatest life story for you. Trust His plan is the best plan; even if things don’t go as you thought they should. Take every week of every quarter, one day at a time. You can do this! Interested in learning more about the nursing program at PUC? If you visit the Admissions website, you can find more information about the program, curriculum guidesheets, and a live chat where you can ask an enrollment counselor anything you need. You can also call (800) 862-7080, option 2 or email enroll@puc.edu for more help. One of the things about PUC’s nursing program that gives students anxiety are clinicals. I remember how awkward and out of place I felt at first. As time passes, you learn a lot and begin to feel more useful and less in the way. Basically from the start of the program you are in the hospital. For the first day they have you paired up with someone to give a bed bath. It’s so funny thinking back to how awkward I felt, wondering, “What supplies do I need? Where do I get them? How do I bathe a complete stranger?” my only task was to give a bed bath and it felt like such a huge task. Having a partner made all the difference though. After each clinical day, I felt more comfortable and confident. I enjoyed clinicals because they allowed me to see what I was studying. I felt I could actually apply what I was learning and use it when I went to the hospital. Each clinical taught me something different, seeing different floors with each rotation. I always had an idea of where I wanted to work as a nurse but I didn’t realize how many different units there were so it was great to experience all of them. Be safe. In every task you’re about to do, be safe. You will learn the different safety precautions throughout the program; use them!! You might see a nurse who takes shortcuts to save time; but never compromise your safety precautions. They’re there to help you, not hinder you. Ask questions. Never be afraid to ask when you are unsure about something. If your nurse asks you to do something and you don’t know how; ask! It seems like an easy concept but sometimes people just want to do what their nurse asks, and come off more competent than they actually are. When you have nurses who have practiced for a long time they forget you might not know how to start an IV pump because it’s something they do every single day. It is your job as a student to let your nurse know what you feel comfortable doing. Speak up! If you’re unsure about something say so! It will get easier to speak up when you’re in second year because your knowledge base and clinical experience is bigger, and you will begin to actually trust your gut. I started to feel like a real nurse when my nurses would ask me questions about our patients and I could actually give them the right answer. You will also have many “ah ha” moments as you connect what your studying to the clinical setting. Take every opportunity you can. As you pass different skills tests, you then have the right to be able to do those things in the hospital (scary I know!). If a nurse asks if you want to put in a foley catheter and you’ve passed the skills test; say yes! When you’re a student you get to have another nurse with you to walk you through the steps if you need it. Once you become a nurse you are expected know be able to perform all the tasks within your scope of practice without help. Take advantage of being a student and learn everything you can! Try to see everything you can. One time a patient of mine was going to have an angiogram done and I had never seen one so I asked my nurse if I could go with him. She said the Cath lab doesn’t usually like to have students but she would ask, and they said yes! I got to go simply because I asked if I could. Take every opportunity to see things you haven’t seen, simply for gaining knowledge. Because I saw an angiogram I will never forget what it is and how it works; and I can better explain it to my patients in the future. Clinicals can be nerve-racking, but trust your knowledge as you gain it, ask questions if you’re not sure, and know every nurse you’re with was once a student. 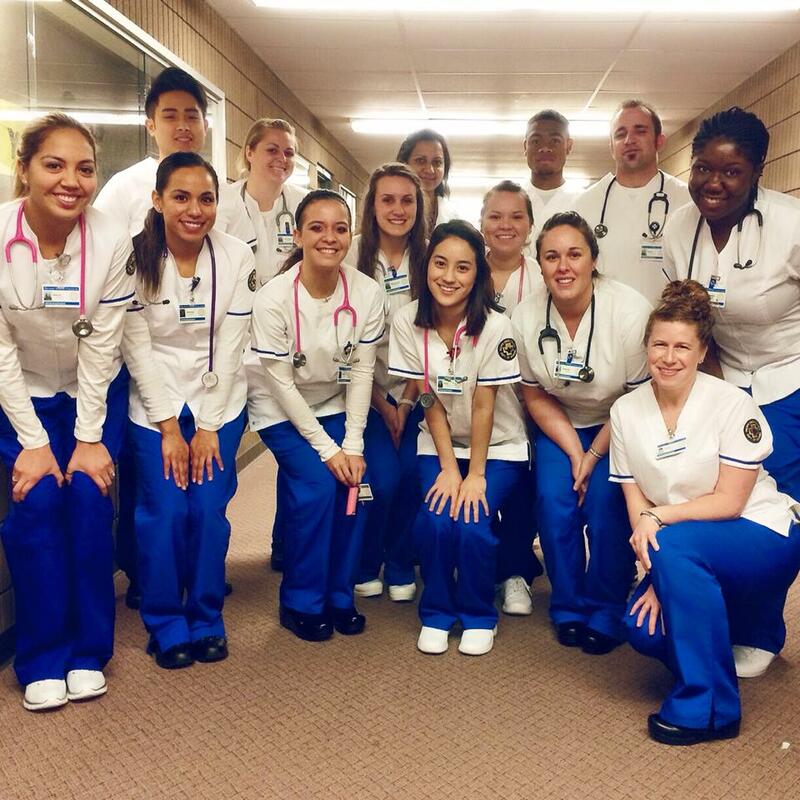 Choosing to major in nursing at PUC was one of my best decisions I have ever made. I heard about the program through a friend’s older sister who went through it, and loved it. I knew I wanted to be at PUC so that was all I needed to hear. As with most people trying to get into any program I asked myself questions like, “Will I even get in?” “What will I do if I don’t get in?” I had all sorts of doubts, but I knew nursing was God’s calling for me; so I pursued it head on. At the end of my freshman year, I decided to apply for fall quarter 2014; in the back of my mind I had a feeling my GPA wasn’t going to be competitive enough for fall admission, but I applied anyway. You’re probably thinking, “She’s going to get in because of the way she’s leading up to it,” But I actually didn’t get accepted into the program on my first try. I knew God had a plan for me, but the rejection was still hard to swallow. I talked with my nursing advisor and figured out I needed to raise my GPA if I wanted a better chance at acceptance for winter quarter. That summer I re-took General Psychology and raised my GPA for the September application deadline. I remember all the doubts flooding my mind once again. I would go round and round thinking, “They only accept 27 students each quarter; why would they pick me?” Looking back, God had a plan all along. I remember exactly where I was and what I was doing when I got the acceptance email: I was at work at the fitness center when I saw the email; I remember seeing the “Congratulations” at the top of the unopened email and I knew I was in! The relief and excitement I felt was like nothing else. I immediately called my family to share the good news. After the excitement wore off; I was instantly nervous and anxious about what the program would hold. I think the biggest thing that scares people is the fear of the unknown; and that’s exactly what I was feeling. The first week of nursing school was like no other; I remember feeling like I was completely submerged under water without a life preserver in sight. As time passed; I began to take control of my schedule and manage my time accordingly. One of the biggest things that helped me through nursing school was knowing my 26 classmates were going through the same things I was; and feeling the same things. If they were going to get through it; so was I. What scared me the most about nursing school was the 75 percent test average; separate from the class score. I was never a good test taker in high school and seriously doubted if I would even make it past the first quarter. I remember studying for my first test and having no idea what to expect. All of our tests are on computers to prepare for the NCLEX (nursing licensure exam) style testing. Sitting in front of a computer screen waiting for the exam password so I could start put every nerve in my body on edge. The most nerve-racking time is after you’ve submitted the exam and are waiting for your score to pop up. I remember I got an 85 percent on my first nursing test and I realized, I can do this. The score helped me realize the program was not impossible. I began to learn a lot about myself and my study habits. I realized I needed to study more. I would start studying 10 days in advance because I just couldn’t retain the information well. Some of my classmates would study the night before and get a good score. I was never like that. The best advice I can give anyone planning on being a nursing student is to learn how YOU need to study nursing style information the best and that will help you get through each quarter. One of PUC’s largest programs is the nursing program. While its popularity is undeniable, the application process can be a bit confusing. We enlisted the help of recent nursing graduate Rachel Dunbar to help make the process clearer. Read on for a very detailed look at the nursing program! The AS in Nursing (Associate of Science degree in Nursing), also called the Registered Nursing (RN) program, is typically completed in three years. Most students take one year of general education classes and then try to apply for fall quarter; to start the 2-year AS degree portion. The actual nursing portion/classes consists of two years, which is six quarters of coursework. The first year students spend taking English, communication, general psychology, and other general education requirements to get into the program—not any nursing classes yet. These students are considered pre-nursing until they apply and get accepted to the nursing program. Yes, you have to apply for the nursing program. Just because you were accepted to PUC doesn’t mean you’re accepted to the nursing program. PUC typically accepts 27 people each quarter. PUC has made it so you can apply for any quarter (Fall: starts in September, Winter: starts in January, or Spring: starts in April). So if you need one more class before you can get into the program, you can take it in the fall and apply for winter quarter instead. Or; if by chance, you don’t get in, you can retake a class or two to raise your GPA and reapply for the next quarter. It’s a huge plus because you don’t have to wait a whole year before applying again. I recommend reading the curriculum guidesheet for more information about the requirements for the nursing program at PUC. Once you finish the three years (one for general education classes, and two nursing program years) you have completed the AS (RN) requirements and are ready to take the state boards, actually licensing you as an RN. The AS is the actual diploma/degree you will receive, but it makes you eligible to take state boards to become a registered nurse (RN) as far as your title. PUC’s program is what they call a 2-step program; meaning it is split between the RN and the BSN portions. You can come back to PUC to finish the last year; or you can go elsewhere. The two year AS program (after you finish your general education and get into the program) consists of six quarters (two years) of actual nursing courses. Each quarter you typically take two nursing classes. Sidenote: The first year you don’t have enough credits to be considered a full load (12) so you need to take a class outside of the program to receive financial aid. It can be exercise science, religion, etc., as long as you meet the 12 credits. A note about religion classes: You have to have three classes (nine credits) of religion before you can graduate with the two year AS degree. They suggest you get them done within the first year of the program (quarters one through three) because the second year (quarters four through six) is busier. You take Medical Surgical (Med-Surg as it is referred to) quarters one through three. The Med-Surg floor of the hospital is the floor where you see just about everything. Each Med-Surg class is broken down into different topics like heart disease, cancer, Crohn’s disease, and many other disease processes. 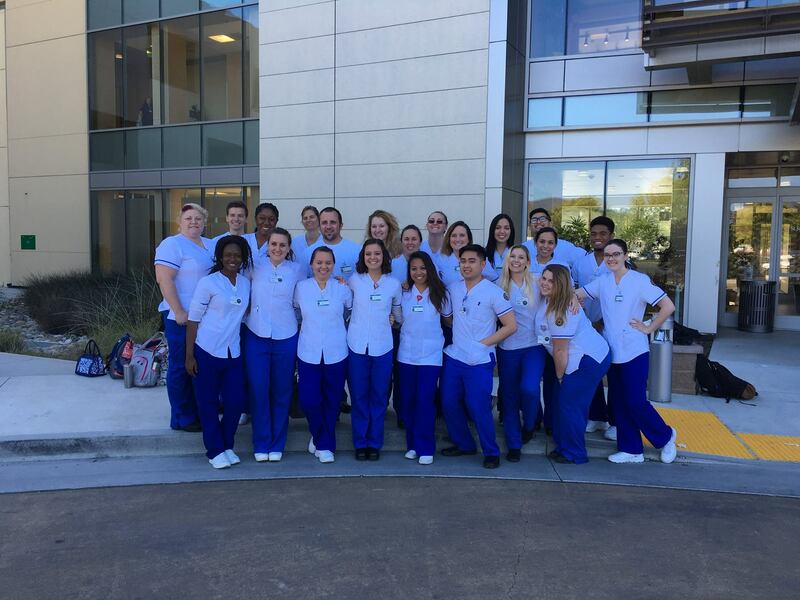 For the first year your Med-Surg class is the one that has a clinical attached to it. So you will be at a local hospital one day a week. First quarter is typically four hours, then eight hours for 2nd and 3rd quarters. The second class you take varies depending what quarter you’re in. So first quarter is Med-Surg one (or nursing one as we call it) and Health Assessment, which is all about how you assess a patient effectively and what clinical manifestations you should see with certain disease processes. Second quarter is Med-Surg two (or nursing two) and Pharmacology. Third quarter is Med-Surg three (nursing three) and Pathophysiology, which is where you learn how the most common disease processes occur in the body. You also have what are called skills tests. You have a certain amount each quarter in the skills lab. You learn skills like how to give medications and the proper steps to follow, how to take vital signs correctly, and a few others. Each skill you learn you do in front of the skills lab professor without prompting to pass. You have three tries to get them right. If you don’t pass the first time the teachers walk through it with you step by step to help with what you missed before you take it again. You take Medical Surgical quarters four through six. For quarters four and five, you continue with the Med-Surg clinical once a week, but now you also have a clinical for your other course at a different hospital, which gives you two clinicals a week plus class time. This is why they want you to get your religion credits taken care of prior to the heavier load. Second year there are varying hospital/shift options for clinicals and I won’t go into every single one. The hospitals change; giving most people some sort of commute depending on what you choose. They try to give you your first or second choice, but that can’t always happen. So, fourth quarter you take Med-Surg four (nursing four) and Mental Health with a clinical as well where you study all kinds of mental health related issues such as bipolar, and schizophrenia. You have one clinical on a Med-Surg floor and then the other clinical is at a behavioral health center. Fifth quarter you take Med-Surg five and Obstetrics (or OB as we call it). You get to learn all about infants and many different things that can happen during pregnancy. You continue with the Med-Surg clinical and then you have an OB clinical as well. During one spring quarter, you’ll also take Pediatrics, which will extend into the summer with a 2-week clinical and class rotation at a children’s hospital. Within the entire program; for every class, you need to have a class score of 75 percent and a test average score of 75 percent. Sidenote: If you decide to major in nursing, you need to get a C (75 percent) in ALL classes pertaining to the AS degree, even if you’re already in the program and taking a religion class. You need to get a 75 percent in that religion class or it will not count toward your AS degree. However, the test average rule does not apply to other classes outside the actual program courses. If you don’t get a 75 percent in the class or test average, you will need to re-take that quarter if there is an available spot. Most of the time the class score isn’t tough; it’s the test average that can be difficult depending on the quarter. There aren’t very many things that keep you from passing nursing school, but they’re all important. The class score/test score as mentioned above. Skills tests, which need to be completed without prompting within the third try. Each clinical is pass or fail. There isn’t a score associated. The biggest thing with clinical is just to be safe. If you’re not sure; ask! There is clinical paperwork due each week which can hinder you from passing if you choose not to complete it. At the beginning of each quarter (besides first), you have what is called a dosage and calculations test. First quarter, you start learning how to calculate meds, and then you are tested during the first week of every quarter thereafter. For quarters two and three (first year), you need to obtain an 80 percent to pass. For quarters four through six (second year), you need a 90 percent to pass. You have three tries to obtain the proper score, but you cannot go to clinical until you have passed; proving that you are safe to administer medications. You have to wait 48 hours between each try; which could hinder a clinical day if you need all three tries. Wow! That was a lot of information! I hope it helped clear up any questions you had about the nursing program at PUC. Maybe you have more questions, which is totally fine! If you visit PUC’s Admissions website, you can find more information, curriculum guidesheets, and a live chat where you can ask an enrollment counselor anything you need. You can also call (800) 862-7080, option 2 or email enroll@puc.edu for more help. 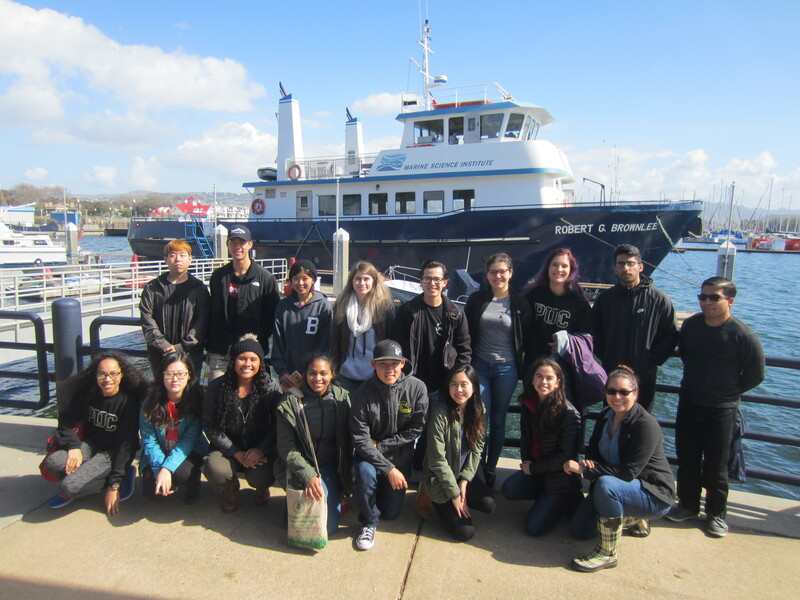 The Marine Scicence class following an excursion on San Francisco Bay. Marine Science with Dr. Floyd Hayes was an amazing adventure. We were privileged to learn from someone who has had firsthand experience with many of the creatures we learned about. His stories of scuba diving and marine research made the material easier to learn. To engage us further with the material, Dr. Hayes took us on a variety of field trips. We rode on the research vessel, Robert G. Brownlee, in the San Francisco Bay to learn about four areas of oceanographic study. We broke up into groups and learned benthology, hydrology, planktology, and ichthyology. Each station was very hands on, requiring students to use the machinery marine researchers use on a daily basis. We used micronets, YSI machines, Van Dorn bottles, and the Peterson mud grab to collect data and specimen. I especially enjoyed using the dichotomous key to identify the fish we caught. The whole experience broadened my understanding of marine life and the work marine scientists do. The trip to Bodega Bay Research Facility was also eye-opening. There we learned about the research graduate students and marine scientists are currently conducting on animals such as the endangered white abalone. We talked extensively with the scientist in charge of the survival of the species. She told us about her practical struggles keeping the abalone alive that is threatened by infection from bacteria that are more prevalent as water temperatures increase. She showed us how the discovery of a bacteriophage is already helping to grow the captive populations and hopefully safe the species. The research facility was especially amazing because it showed us firsthand the tedious yet challenging work required to save endangered species. The longest and most exciting trip this quarter was the trip to the Farallon Islands. We left from the San Francisco Bay in an all-day whale watching vessel with a group of individuals passionate about marine life. As we left the bay, the swells were large and the air was cold, but as we got further out, the beauty of the Pacific Ocean was before us. Harbor seals were seen following the boat and showing a playful display called porpoising. A blue shark swam right up to the boat; it seemed mere feet away. Porpoises were graciously jumping out the water. A single gray whale was very diligently migrating south. Thousands of breeding marine birds were nesting on the secluded rocks of the Farallon Islands. We were lucky enough to see at least 10 humpback whales; the males were singing and performing majestic breaches for what seemed like hours. The trip was an educational and life-changing experience. Never have I felt that close to nature in its undisturbed form. The Farallon Islands are really a special place. I am so happy I took the class and got to see and learn more about the creatures God created. To learn more about biology at PUC, visit the department of biology website. 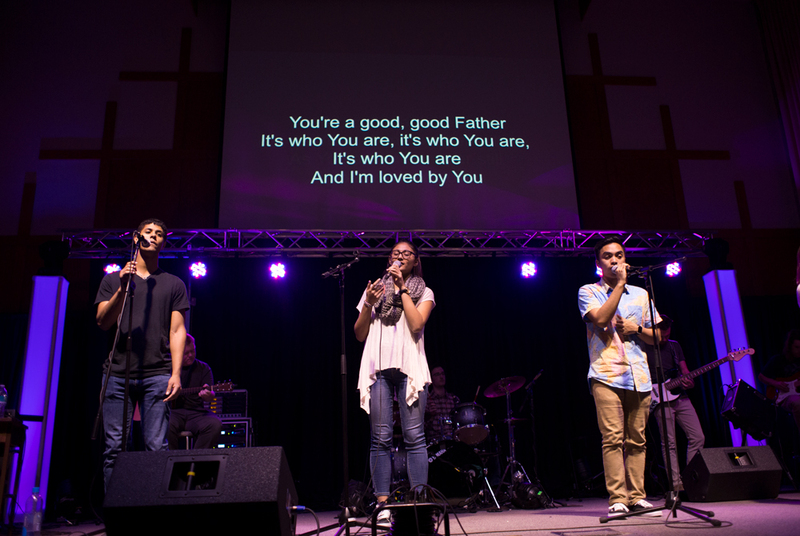 Pacific Union College held its annual student week of prayer the week of April 10. Student week of prayer is a special time for the students, giving them the opportunity to experience the power of God’s work in the lives of their peers. “It is more personable, more real,” said Jason Bajwa, a senior biology major. This year’s student week of prayer took place in Dauphinee Chapel, a more confined and intimate worship space, giving students a feel of comfort and closeness with each other. Students spoke of God’s ability to work in the life of a sinner. The personal testimonies had a powerful impact on listeners. Inspirational and uplifting words were used—transformative, change, willing to use you—to give listeners a glimpse into how God works. The speaker series consisted of Lulu Kabanje, Randy Ramos, Daniel Grigore, Giselle Garcia, Milka Saint-vil, Laurant Panggabean, Nic Miller, Jamal Armstrong, Alex Chang, and Andy Palomares. There were morning and evening meetings each day. One of the week’s highlights was the talk by Andy Palomares, future religious vice president of the Student Association. He ended the evening talking about God as our ultimate defender. His demeanor and style made it easy for students to relate with him. In addition to bringing astounding energy, he owned the stage pacing back and forth with confidence and authority. Palomares touched on a more personal issue. After disappointing his father by doing something he should not have done, he felt guilty and ashamed. At times, he could hardly look himself in the mirror. He felt disconnected and distanced from God and his father. But upon reading the Word, Palomares realized it wasn’t God who was doing the distancing, it was himself. “There’s nothing I could do to fix what was wrong, because Jesus was the problem fixer. He is the one interceding for us,” he said. Palomares realized there was nothing in his power, nothing he could do to right his wrong. However, he realized the importance of accepting forgiveness, which his father provided. After a successful week of student testimonials, many students felt a need to reassess their lives and re-accept God as their Lord and savior. By mentioning their past problems, student speakers made it known no one is perfect. Each student’s sermon emphasized perfectness is not a prerequisite to be used by God. Student testimonials were a great reminder of how God can use any life for His glory and purpose of furthering His kingdom here on earth. Seong devoted many hours to a study of Alzheimer’s disease. 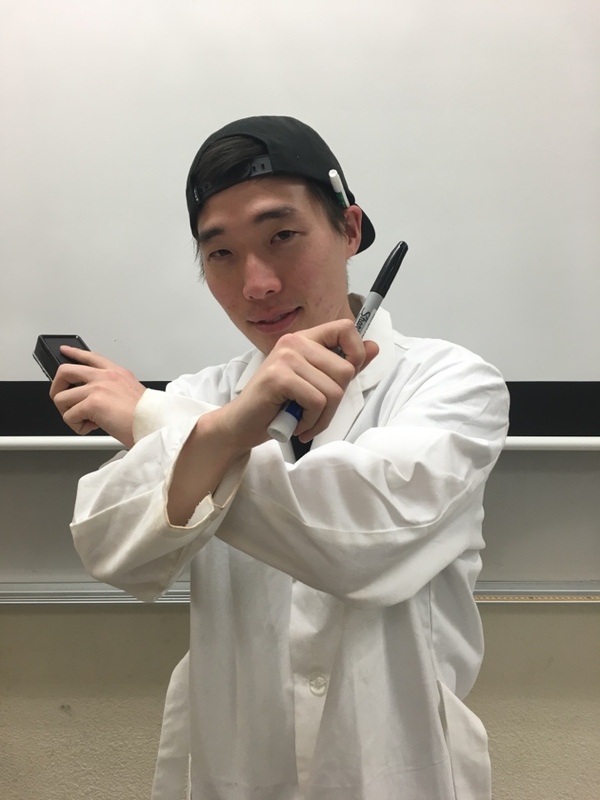 Meet Seong Hwang, a senior biology major. Last summer, Seong conducted research out of PUC’s very own Clark Hall microbiology lab. After college, he plans to go on to dental school. I participated in research that studied of how over consumption of food could expedite the process of Alzheimer’s disease. In addition, I also learned to grow and proliferate C. elegans in their respective medium to be tested for research. What did you learn during your research? Although my colleagues and I failed to get the consistency in our data, I learned to formulate ideas to arrange the procedure for the particular experiment. I also learned the behavior and life stage of C. elegans. In addition, working with my colleagues also helped me to understand about teamwork and how fun it is to be in lab. How did PUC help prepare you for this experience? At PUC, there are many great professors who have many years of research experience. When I had hard time figuring out the procedure for the research, Dr. Sung not only sent me helpful articles but also spent many hours with me in the lab teaching me how to use research tools in the microbiology lab for the experiments. Unlike big universities, many professors at PUC are willing to help students in their research, so don’t waste the opportunities you have as a biology or environmental studies major.